Ok so it’s back to this ongoing game of hide and seek started by the Wellington Monument. It seems to me the deer are doing the seeking, maybe they have been told to count up to a hundred first. The monument has made a slightly better attempt at hiding on this occasion but still I’m not sure about its ability to totally fade into the background. It looks like it has moved into a suitable position behind all the darkened trees but really somebody should tell it to maybe lean over a little. I am beginning to develop a love of photographing the monument these days, I really love wandering off deep into the park and then turning around to see what kind of position the monument seems to have found itself in. At times it genuinely does seem like the monument can move around…………………………………………………………I think I will have to cut todays post short, why ? Well let me explain, if you could see the scene in front of me at this very moment in time you would also find it difficult to write this post. Basically I have a maniac two year old child leaping around the room to his new great love which just happens to be “Sitting On A Fence” by The Housemartins. So with the words “Dance Daddy” ringing in my ears I will bid you good-bye. 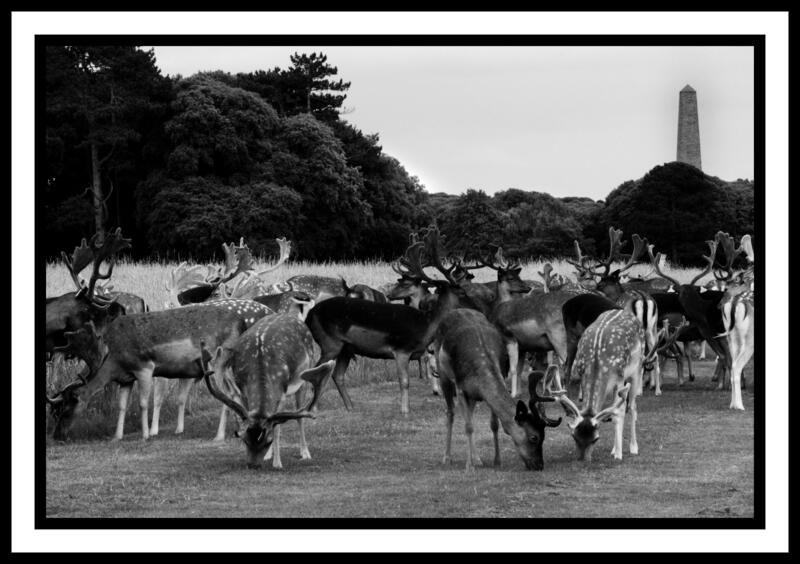 This entry was posted in Irish Landscapes, Phoenix Park and tagged Black and White, Phoenix Park, Photography. Bookmark the permalink. Hey Dave, you know the great urban myth about the monument? It took many years and mucho cash to build, and when it was finally done, a grand banquet was held in it’s crypt for local dignitaries. The crypt was then sealed at the close of the meal, entrapping all the dirty dishes etc, for all time. Now thats the kind of information that I like to get from people, thanks Dudley. I would love to think it was true, in fairness it makes for a great story so lets just tell everybody from now on that it’s entirely true. I reckon there’s a fair few cider addicts stuck down there too, probably found a way in and then forgot where they were. Wonder did they do the washing up before they sealed the crypt.